In the U.S., we tend to live in a bit of a bubble, accepting everything we are exposed to on a daily basis as normalcy. We forget it isn’t the same in other countries around the world. Case in point: Lucky Charms, an artificially-colored, GMO-riddled cereal popular in the U.S., recently made its way to U.K. store shelves, and parents are outraged. Lucky Charms, made by GM, is a common breakfast cereal here in the U.S. I imagine many older individuals reading this now thought its blue moons, yellow diamonds, and green clovers were the best thing that ever happened to breakfast growing up. Older and wiser, however, many of us won’t let our children touch the product. Still, Lucky Charms remains one of the top-selling cereals on the market, and it has recently debuted overseas to a less-than-thrilled market. “Imported Lucky Charms can have adverse effects on children’s behavior,” said an article originally printed in Britain’s Daily Mail. “It is marketed as nutritious, but contains four suspect colourings,” they warn. 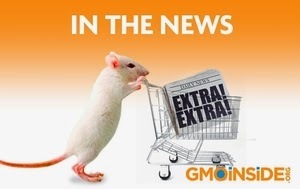 The cereal recently showed up on shelves of Tesco grocery stores, a chain of stores that bans genetically modified ingredients in their own store-brand, but obviously has no problems selling genetically modified imports from the country who does GMOs best. Is food coloring bad for you? In the U.S., a very small percentage of parents are aware of the harmful effects of artificial food colorings or the potentially cancer-causing effects of genetically modified grains. Some, even with that knowledge, will still cave and buy their children the sugary, nutritionally devoid breakfast. But in a country where the awareness is at least slightly higher, where warning labels are required on foods with artificial colors, there is outrage over Lucky Charms even being on the shelves. One father, a psychotherapist from southwest London, buckled and bought Lucky Charms for his 9-year old son. Hyperaware of what this new food might do to his son, the father described him as “very giddy” after eating the cereal. “As his behaviour became more and more unusually hyper and lacking attention I then noticed that he was enthusiastically eating and talking about this new cereal called Lucky Charms,” said Mr Stevenson. “I checked the box and found out that in very small lettering it said that it was a GM food. I destroyed the packet and he calmed down the next day but I was very concerned and angry”. Seeing how parents “across the pond” react to one of the most popular U.S. breakfast cereals truly puts things in perspective. While parents are angry at Tesco and their decision to sell these cereals, we simply accept them as normal and rarely give it more than a fleeting thought. We can hope this outrage will translate to concrete action on the part of Tesco, perhaps pulling Lucky Charms from their shelves for the sake of British children and their concerned parents. One has to wonder, what would happen if every consumer in the U.S. decided to get “concerned and angry” about the state of our food system. Demonstration i Stockholm den 4 september.